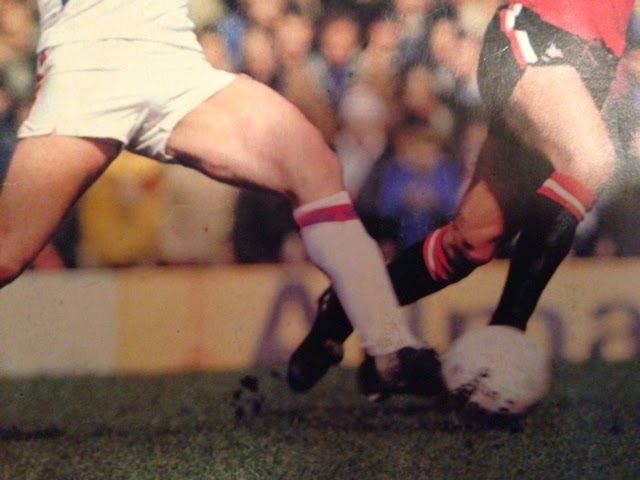 Some footballers legs, a few years ago. An English sportswriter has been fired from his job, and faces further action from British journalism’s governing body, for continuing to irritate his readers, colleagues and superiors with shockingly predictable jokes/puns and doctored images of controversial footballer Luis Suarez. Stephen ‘Soccer Stevie’ Hockley, a 59-year-old football-mad part-time journalist and amateur frogmologist (he collects scuba diving equipment) from North London, has, since Mr. Suarez was sent home from the World Cup for biting another player, featured 194 different images relating to the Uruguayan on his Facebook page, generating in total, five ‘likes’ and three comments, two of which were from colleagues warning him to quit it, or he’d be fired for being a pain in the arse, and another from his Aunt Irene in the west of Ireland, who asked him if he was ever going to grow up and stop being such a gobshite. It is the ninth time that Mr. Hockley, a lifelong supporter of Manchester United since 2007 (he did support Arsenal, and before that Chelsea, Aston Villa, Liverpool, Nottingham Forest, Leeds United and when he was on holiday in Edinburgh, Dundee United) has faced disciplinary action with regards to being not very funny. In 2006, he forwarded 116 emails about Zinedine Zidane’s World Cup Final headbutt and was suspended for a week, in 1995, he mailed 812 letters with jokes about Eric Cantona’s kung fu kick into the crowd at Crystal Palace (though he did apologize for that once he became a United supporter) and in 1986, he telephoned 4 of his relatives claiming to be God and that he’d like to speak with Diego Maradona. Says Oliver Gibb (17) the Managing Editor of The Swindon Furniture Trader and Antique Collector’s Monthly, where Hockley has had a football column since the mid 1970s; ‘The dude’s like, so, unfunny. He’s texted me 14 times with jokes since lunchtime and I’ve had no reason to LOL, never mind ROFLMAO’. Another of Hockley’s colleagues, Marjorie Dibbs, who pens an occasional gardening column from prison, said; ‘I’m not surprised, he’s always been a c*nt’. Admittedly, we at The Heraldy Press weren’t prepared for language like that, and sure, it’s too late to change it now. Mr. Hockley, who was unavailable for comment, has eleven minutes with which to decide whether he will appeal his dismissal, though since typing that sentence, he did contact us to say something about Luis Suarez winning the Golden Tooth award, and how the footballer probably just fancied some Italian, but sure, we’d already hung up by then. Words by Bosco Coppell, Image by Yvonne’s Curtains and Antique Telescopes Store.